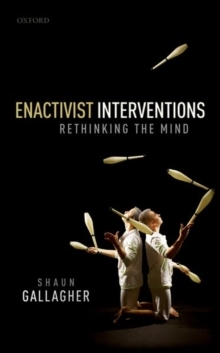 Enactivist Interventions is an interdisciplinary work that explores how theories of embodied cognition illuminate many aspects of the mind, including intentionality, representation, the affect, perception, action and free will, higher-order cognition, and intersubjectivity. Gallagher argues for a rethinking of the concept of mind, drawing on pragmatism, phenomenology and cognitive science. Enactivism is presented as a philosophy of nature that has significantmethodological and theoretical implications for the scientific investigation of the mind. Gallagher argues that, like the basic phenomena of perception and action, sophisticated cognitive phenomena like reflection, imagining, and mathematical reasoning are best explained in terms of an affordance-basedskilled coping. He offers an account of the continuity that runs between basic action, affectivity, and a rationality that in every case remains embodied. Gallagher's analysis also addresses recent predictive models of brain function and outlines an alternative, enactivist interpretation that emphasizes the close coupling of brain, body and environment rather than a strong boundary that isolates the brain in its internal processes. The extensive relational dynamics that integrates the brain with the extra-neural body opens into an environment that is physical, social and cultural and that recycles back into the enactive process. Cognitiveprocesses are in-the-world rather than in-the-head; they are situated in affordance spaces defined across evolutionary, developmental and individual histories, and are constrained by affective processes and normative dimensions of social and cultural practices.